Often guitarists will reach for chord ‘grips’ that have roots in the bass, sometimes out of habit. This can be effective when playing without a bass player, playing Freddie Green style rhythm guitar or Latin-style comping. On the other hand, it can be limiting in other contexts when a freer more harmonically rich approach is desired. 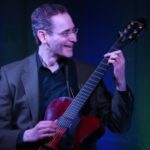 Rootless chord voicings, voice leading, and chord substitutions over standard tunes and modern jazz compositions will be the focus of this masterclass. Master compers like Jim Hall and Ed Bickert love to play clusters to get a more pianist sound adding interest to their voicings. We’ll examine many multi-use voicings that can get a lot of mileage in comping. Concepts outlined will include adding open strings to voicings, quartal voicings, and a variety of interesting comping rhythms. In order to freely use the upper structures of chords and substitutions, the chord theory has to be solid. We’ll get deep into the theory and discuss the reasoning behind substitutions that work. Also we’ll take a look at bossa comping, polychord reharmonization, and chord expansion techniques. Written examples will include tunes or selected measures from: Come Rain or Come Shine, Windows, Desafinado, What Is This Thing Called Love and Gone With The Wind. TAB is included along with standard notation. Learn to comp creatively and confidently while expanding your chordal vocabulary. Once again, the ugliness of Work prevented me from attending live, but I just finished watching this class; I don’t know how he comes up with these original and thought-provoking ideas. There are others here that deal with this subject as well, by Lorne Lofsky and Sid Jacobs especially, but this one is still different than those: not better or worse, just a different take. The notation is especially handy for slow learners like me. I hope to have some surprises in store tomorrow at my regular Wednesday gig. Thanks again, Mr. H.